Recently I have been on a bit of a health kick and being a girl who does love her rich food finding healthy yet delicious dishes is a constant quest. Having just spent some time on the South Californian coast as well as some time in the lovely harbour in Baltimore I have a new found love of crab. Although I might sound like a bit of a jet setter this couldn't be further from the truth. I have only very recently taken my first long haul flight and hadn't even ventured onto a plane until I was 18. Anyway back to this recipe. We are lucky enough to have an amazing farmers market in the village which we live in and the other week the fish monger was having a two for one offer on crabs, too much of a bargin for us to pass up. I have however since tried this recipe with tinned crab meat which is much cheaper and works just as well, especially if you prefer the gentle taste of the white meat. This is so simple anyone can cook it, seriously for the work to taste ratio this one is a real winner. 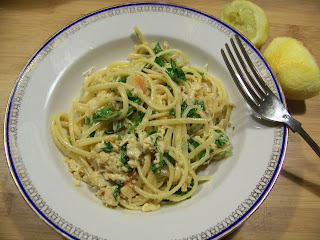 Put on a pot of boiling water and add your linguine, the sauce mixture will feed 3 to 4 people so add pasta for that many. Crush the garlic, chili, salt and lemon zest in a pestle and morter to make a paste, add in the juice of the lemon and a very very large slug of olive oil (about the same amount of lemon juice). Add in your crab meat and mix until combined. In another pan add the crab mixture and warm on a low heat, just as it is starting to warm through add in your drained linguine and mix. Stir in your watercress and cook for a minute or two until the cress has wilted. And that is it, well apart from eating it. 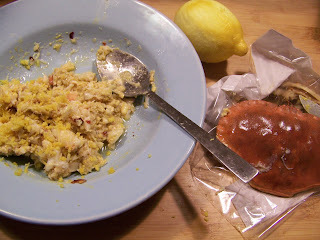 Since I made this a few weeks ago it has become a weekly favourite, I can't get enough of the lemony crabby goodness. If you try any of my recipes I would love to know what you think. so glad you liked it sally, it is a great recipe if I do say so myself. I sew, a lot. It makes my fingers sore but I love it. I make bags, purses and brooches mostly but sometimes other things too.